The HCISD strategic plan, Transforming Learning for Global Achievement, works as a tool for school district leadership to plan the next three to five years of development for HCISD. The plan was developed as a result of five months of information gathering from over 800 strategically selected individuals to represent all of the various subgroups of HCISD stakeholders, including staff members, students, parents, and community members through focus groups, surveys, and planning committees. The result of this effort is a set of five goals that each carry specific result statements for achieving those goals. All of the components to Transforming Learning for Global Achievement align with the input provided through the information gathering process. Harlingen CISD will become a system of world-class schools, where students develop the knowledge, skills, and learning habits that prepare them for college and career success in the 21st century. Harlingen CISD will provide educational excellence for all students, cultivating college, career and workforce readiness, while providing students with choices for a meaningful and successful life. Key details of how the Harlingen Consolidated Independent School District plans to transform its schools during the next three to five years were released after Tuesday night’s adoption of the district’s strategic plan by its board of trustees during its regular meeting. Trustees approved the document titled “Transforming Learning for Global Achievement” after almost five months of planning and preparation that included input and collaboration from HCISD staff, students and community members. The strategic plan outlines new district goals, as well as specific result statements that will shape the development and implementation of new programs, renovations at district facilities and integration of new technology. Some of the key themes from “Transforming Learning for Global Achievement” included developing learning environments conducive for collaboration; creating curriculum to fit the individual needs of students; opening of specialized and unique schools for students at all levels of education; and to align high school programs with post-secondary endorsements and certification programs for career readiness. 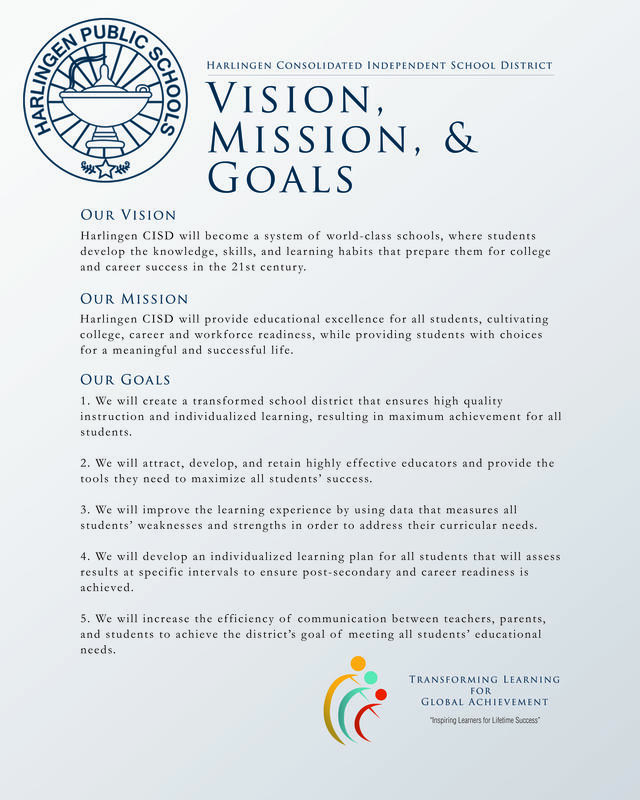 HCISD has published the strategic plan’s goals, result statements and community responses on a website at www.hcisd.org/transforminglearning. Details from the specific action plans and the implementation of new programs and renovations will be released once they are finalized, Dr. Cavazos said. Some of the next steps include the redesign of the two comprehensive high schools, Harlingen High School and Harlingen High School South, which will align to the format at the Dr. Abraham P. Cano Freshman Academy for schools of study and project-based learning. Goal 1: We will create a transformed school district that ensures high quality instruction and individualized learning, resulting in maximum achievement for all students. SR1.1 Create and maximize flexible learning spaces. SR1.2 Create a supportive school culture and environment that inspires students and teachers. SR1.3 Create and expand technology rich environments that empower students to maximize their learning experiences. SR1.4 Create specialized schools that offer unique learning opportunities for both our students and community. Goal 2: We will attract, develop, and retain highly effective educators and provide the tools they need to maximize all students’ success. SR 2.1 Implement a transformed recruitment plan to attract highly effective educators. SR 2.2 Revolutionize the new teacher induction program for a multi-year professional support. SR 2.3 Create avenues for educators to acquire new knowledge and reach high levels of success. SR 2.4 Develop clear criteria of expectations for highly effective educators for the purpose of creating a systematic approach to assessing performance. SR 2.5 Establish a retention plan for highly effective educators. SR. 2.6 Create multiple venues for professional development designed to transform the learning experience of students. Goal 3: We will improve the learning experiences by using data that measures all students’ weaknesses and strengths in order to address their curricular needs. SR 3.1 Implement common planning time for all teachers to analyze data to drive instruction. SR 3.2 Create classroom learning environments to capitalize on opportunities for communication, collaboration, creativity, and critical thinking. SR 3.3 Develop curriculum with an emphasis on preparation for post-secondary endorsements and certificates/certification. SR 3.4 Create a locally developed evaluation plan with established standards to measure, assess and determine the effectiveness of both current and future programs. SR 3.5 Develop an Instructional Technology Support Team focusing on incorporating technology into the curriculum. SR 3.6 Infuse technology into the curriculum to enhance classroom instruction and learning for all students. Goal 4: We will develop an individualized learning plan for all students that will assess results at specific intervals to ensure post-secondary and career readiness is achieved. SR 4.1 Implement a single district-wide assessment at each grade level, pre-k through second grade. SR 4.2 Transform the pre-kindergarten program into a purposeful, enriched learning environment for all students. SR 4.3 Implement a systematic approach to develop and utilize an electronic individualized portfolio. SR 4.4 Define and assign roles of professional staff to being grade appropriate focus to college and career readiness. SR 4.5 Align activities at all levels that promote college and career readiness. SR 4.6 Expand opportunities for after school and summer enrichment activities aligned with the curriculum. Goal 5: We will increase the efficiency of communication between teachers, parents, and students to achieve the district’s goal of meeting all students’ educational needs. SR 5.1 Spark partnerships by providing information to and training for our community. SR 5.2 Connect the community and the district with innovative approaches addressing educational needs of students. SR 5.3 Saturate the community where it naturally exists with a Harlingen CISD presence to create a committed partnership.